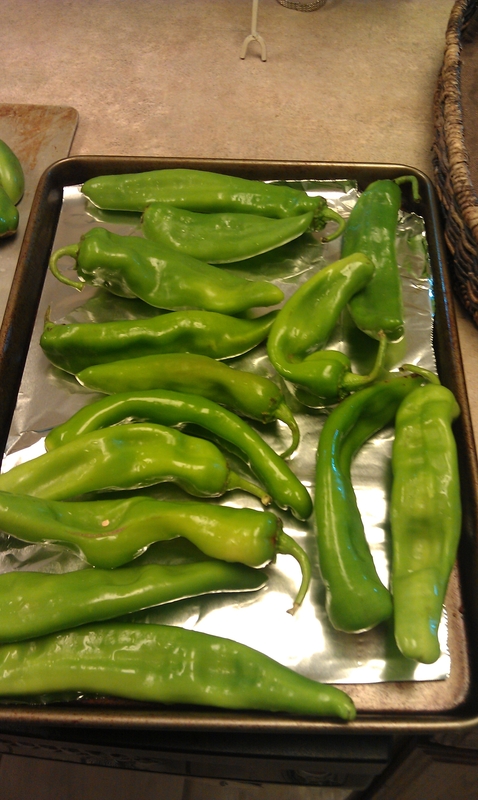 It’s that short time of year when the lovely Hatch green chiles are in season. I said I wouldn’t do it myself this year, but Sunday looked like this. 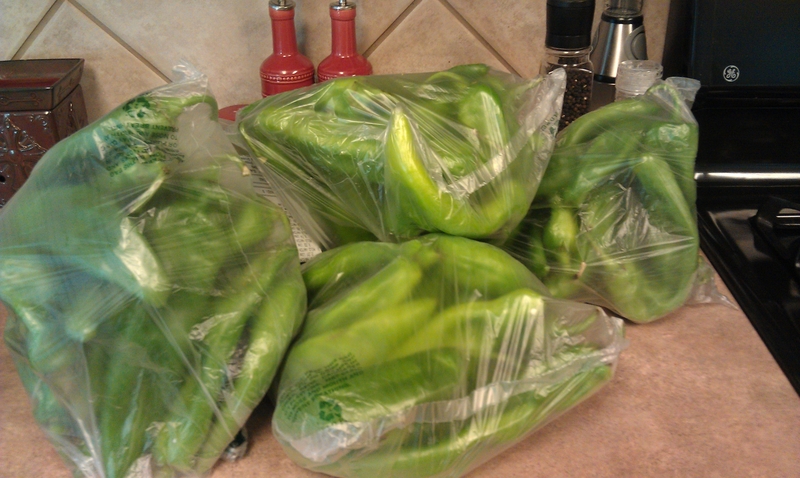 Not sure why I didn’t buy the whole case, I bought almost all of the hot Hatch peppers that HEB had (1 box). I don’t do mild. It was 112 in Austin area on Sunday, so I was not about to do the gas grill (even in the morning when I did this) or do all 15 pounds on top of my stove. Instead I opted for the broiler. Took me an hour to do all of them. Gotta get them nice and charred. You peel that part off anyhow. 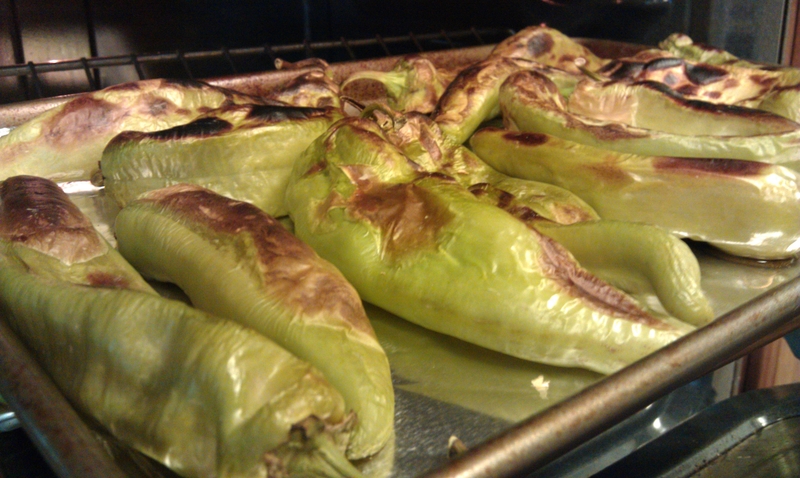 After charring them, put in a plastic bag or container to sweat the skin loose. Makes them easier to peel. Peel the charred skin off, de-seed. You can then chop or store whole. I did a little of each. About 1 handful per freezer bag. I ended up with 8 bags, plus 1 container to keep in the fridge for the week. 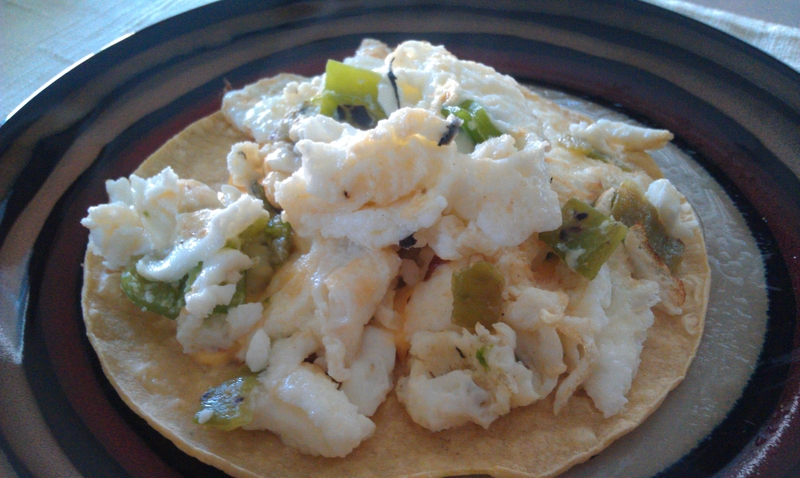 Then pop into the freezer to have awesome Hatch all year long! Or my attempt at knocking off Chuy’s Green Chile Stew from their festival menu this year (my lunch this week with veggies and salad). In my crockpot for 6 hours on low I layered 1 large sliced onion, 1 pound of potatoes, 1 bag of frozen carrots, 2 bay leaves, 1 pound of chicken breast. 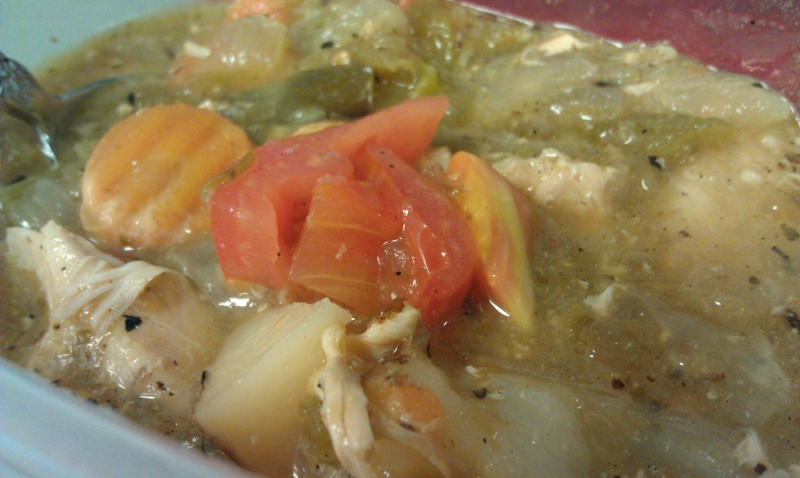 Poured on top, 1 can of FF cream of chicken soup. 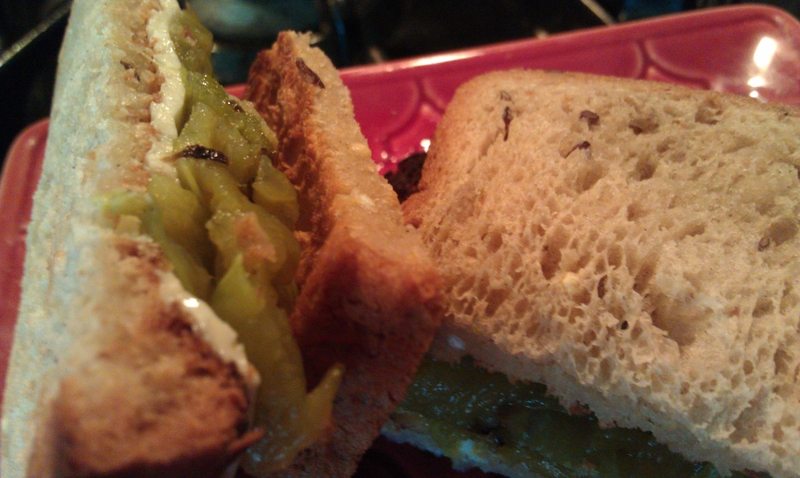 When it was almost done, I added a half cup of roasted hot green chiles and a jar of fire roasted tomatillo salsa. Garnished with thick diced tomatoes. Odd, it’s usually full on sweaty. 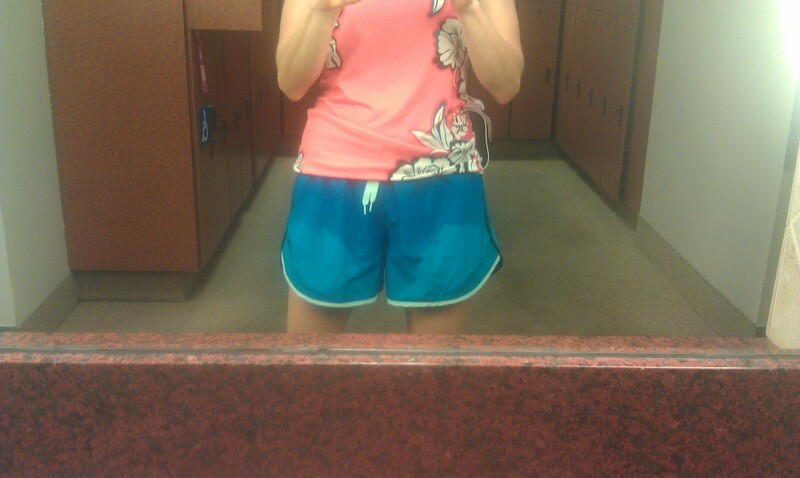 This time it just looked like I peed all over myself! I started earlier than I had been though. All pavement would have been best, I don’t slow down or tense up on pavement in the dark. I did partial trail which made me paranoid of a fall (not sure why, never fallen in the dark). Ok run overall, but my pace just isn’t where I want it. At least I can still make it through my runs though. 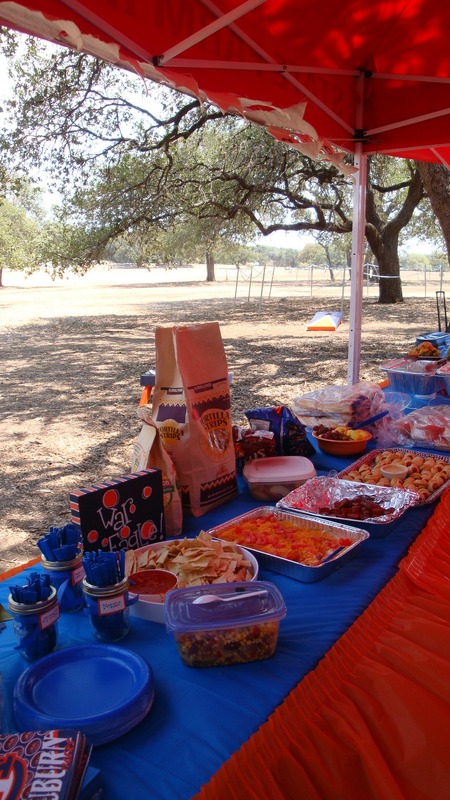 Then jetted over to Zilker Park for the Austin SEC picnic. 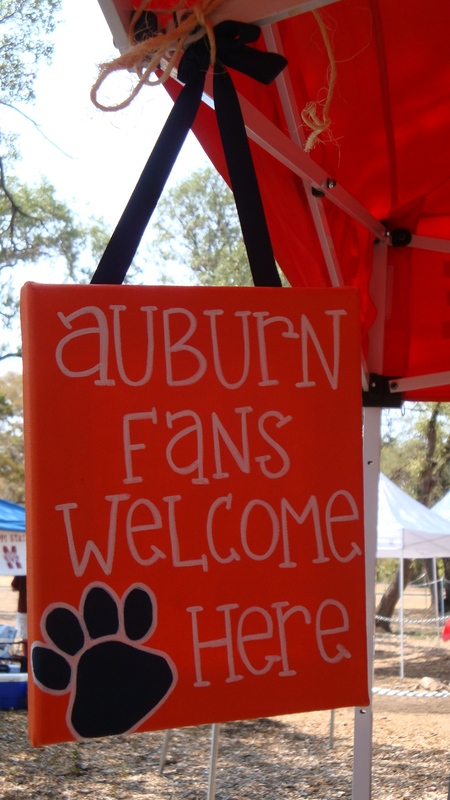 Dan was already there helping set up camp for Auburn. 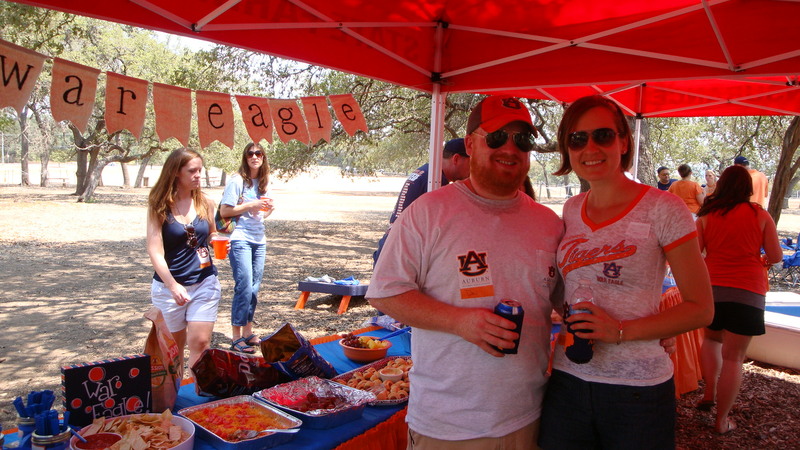 Great turn out (over 40 people for the AU alumni club). 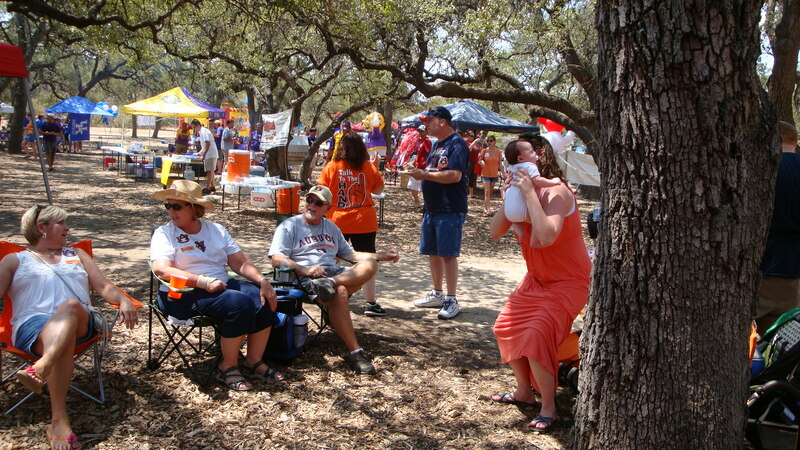 All of the SEC schools were there. LOTS of babies. I had to leave early for a sorority alumni event, but I was there for the first hour. Really cute set-up. 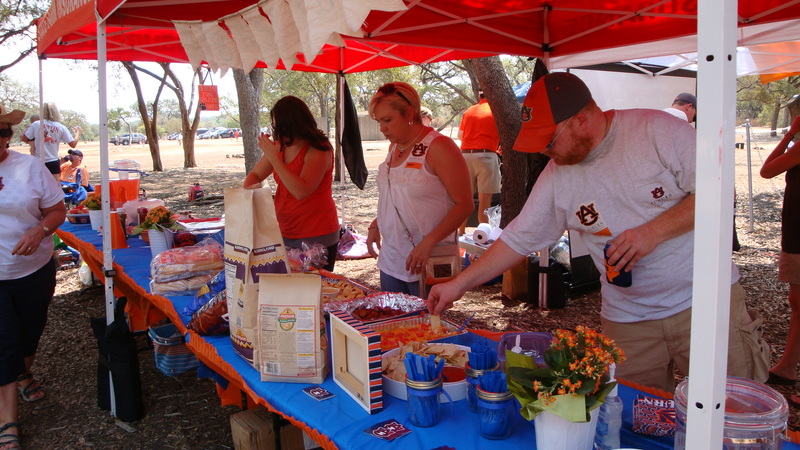 Lots of great food. I didn’t eat much, because I knew i’d be having Chuy’s shortly after that. Not sure I could have handled the 111 degree heat all day long. In the shade it wasn’t so bad, but the half mile back to my car was brutal. I looked a mess when I got to my next stop, which was Chuy’s in Round Rock. After all was said and done and it was evening, Dan and I wound up going to the movies to see “Our idiot brother”. It was good, not fabulous, but good. Long day, but great fun. 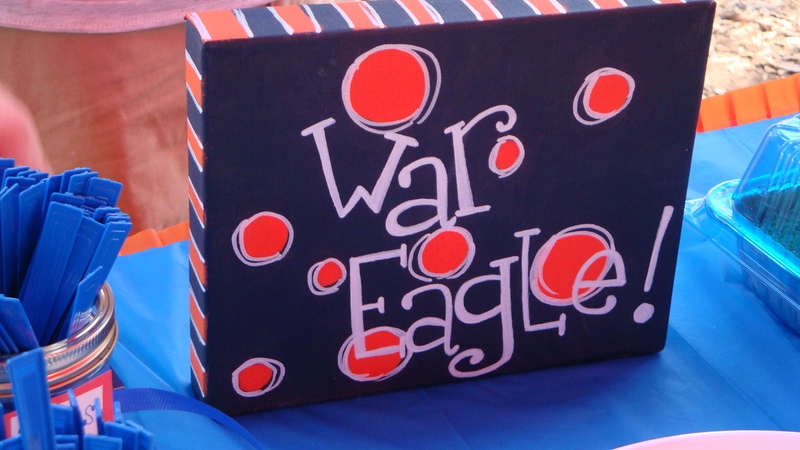 Got to meet new people at the SEC picnic and the sorority meet-up. Plus get some relaxation in there too with AK and at the movies. Successful Saturday, although next time i’ll pass on 110 degrees! 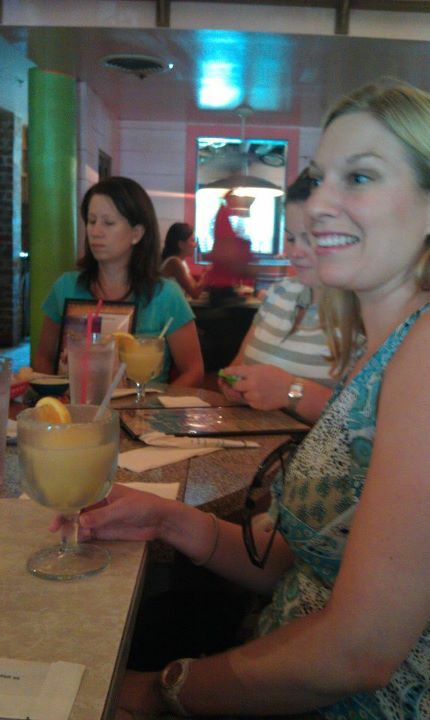 Chuy’s in Round Rock on Saturday for sorority alumni meet-up late lunch. I got charro instead of refried beans. I don’t really like Mexican rice, but their Green Chile rice is good. Will see about making this at home, seems like it would be easy. I’m pretty sure Mr. Picky would like it. Would be good with shrimp or chicken too. 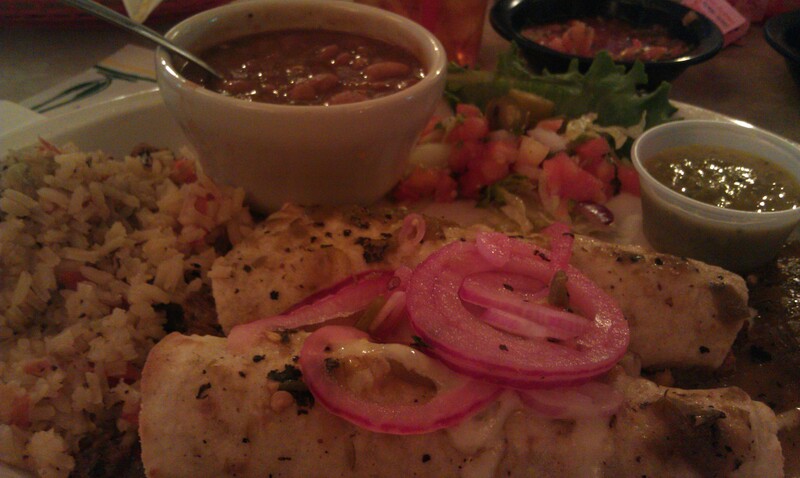 My sister got the Southwestern Enchiladas, which she liked. She also had the new peach sangria margarita. I didn’t make it into any of the photos or the group photo at the end 😦 I had to leave early to get a haircut. The place I usually go, Baby Face Too, in Leander, was having a benefit on Saturday, donating all proceeds from haircuts and refreshment sales to the victims of the most recent fire in our area (2 weeks ago), which burned over 13 houses. I made an effort to get over there to get my hair done and support the cause! 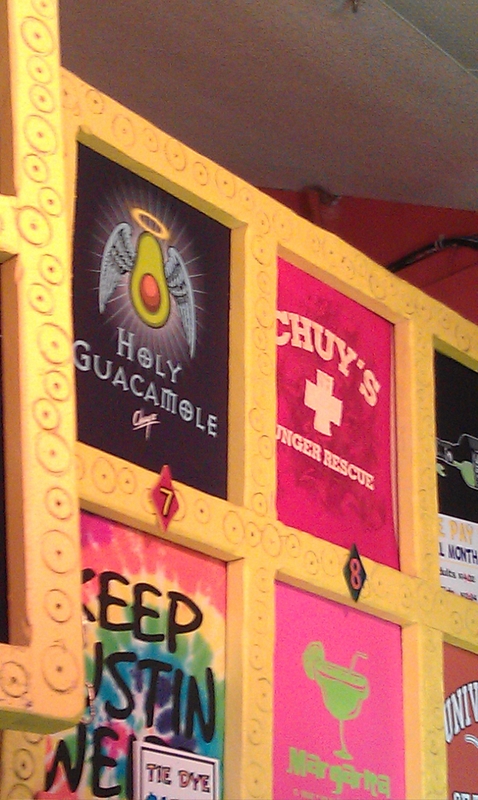 If you’ve never been to Chuys, you need to go. They used to only be in select Texas cities, but just like Rudy’s BBQ, they are popping up all over the country! 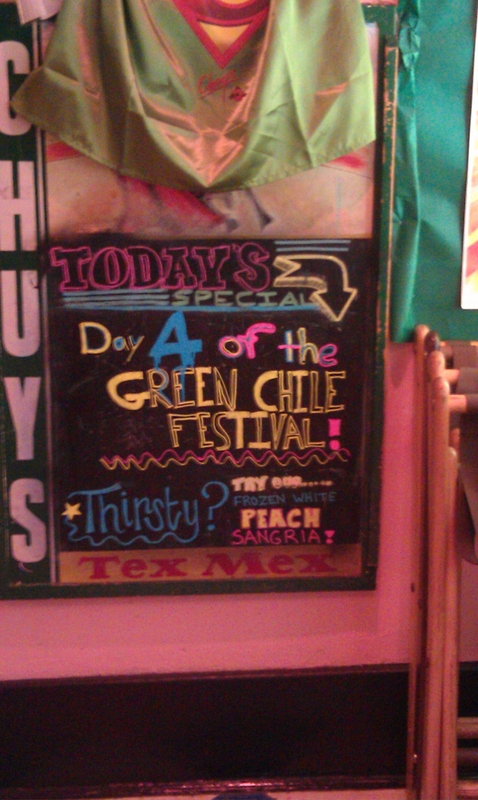 Every year they have Green Chile Fest for 3 weeks from the end of August until mid-September. 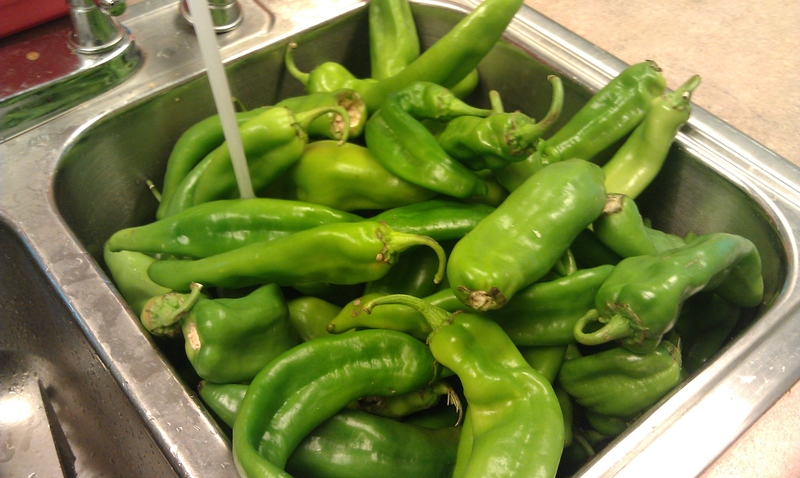 This special menu features Hatch Green chiles in special limited time only menus. A new menu is created each year. 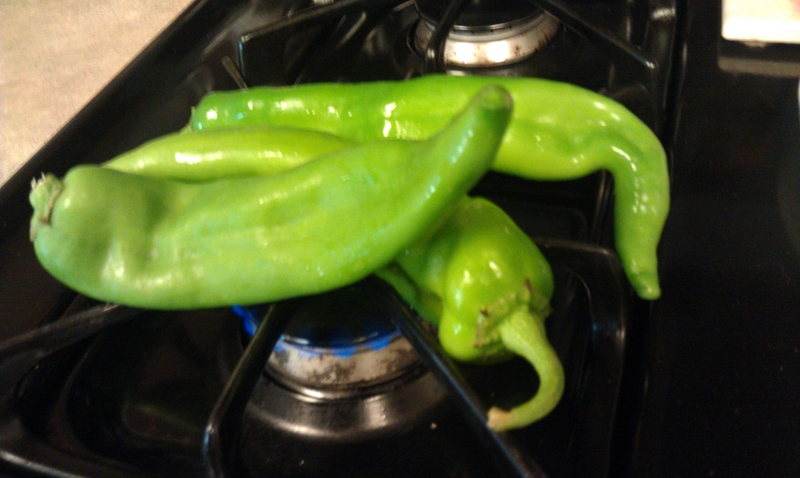 Dan, my sister, and I have done Green Chile Fest every year. It’s not unusual for us to go 3-4 times during the festival to try things off of the special menu. 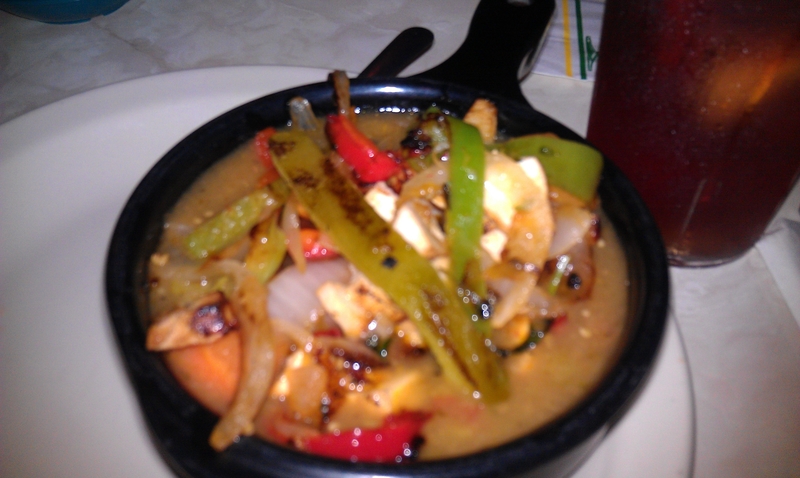 The spicier the better. 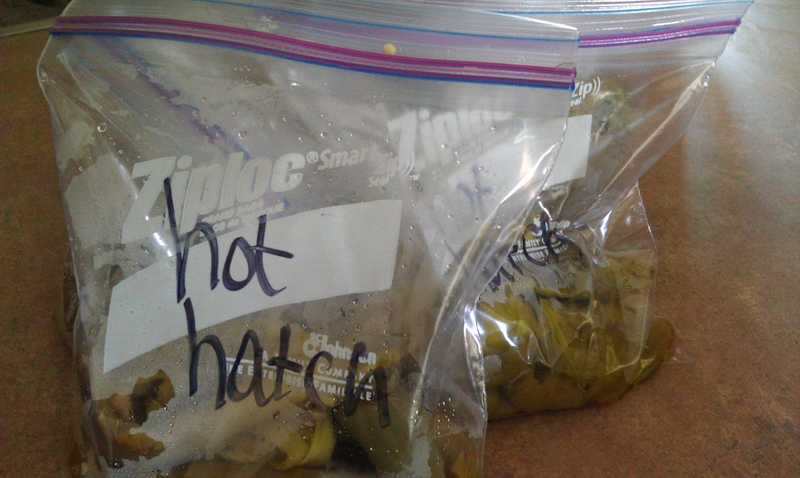 I had a sick obsession with green chiles. Thursday night before Dan and I went out to Shady Grove to see the Uncle Lucius concert, we hit up Chuy’s for GC Fest visit #1. 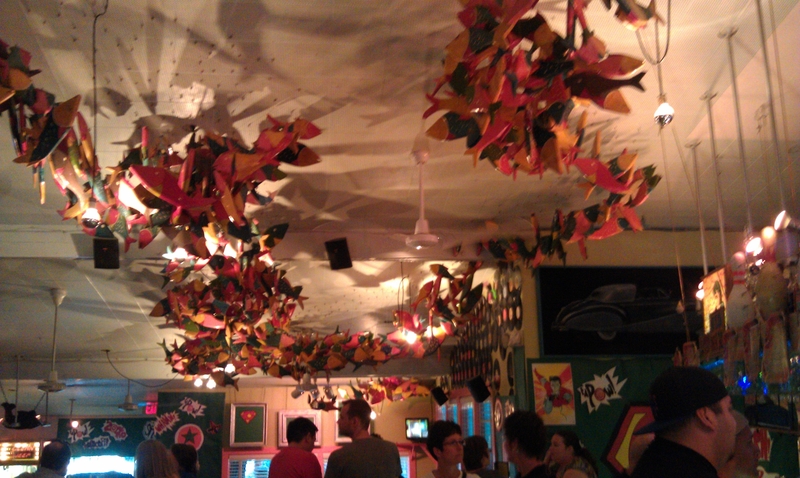 No two Chuy’s locations look the same. Very eclectic. It was SO tasty. I need to make this at home for myself. Sounds like a great kitchen experiement. My only regret is I got the small one, not the big one. It came with a salad too. (and of course their thin chips and salsa). I don’t really care for their salsa much (too runny). Dan got the Bongo Empanadas, very good and very spicy (they were actually made with corn tortillas). Also a winner. 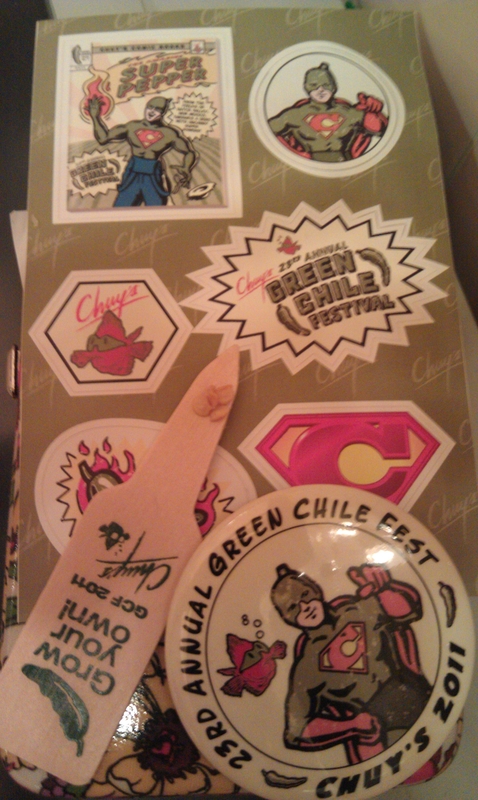 Every year Green Chile Fest has a theme and special swag. Last year it was the Beatles. This year it was super heroes (stickers, buttons, magazine, and green chile seeds). Thanks for the supportive emails, texts, comments, and messages, I appreciate it. That is a true fact, I didn’t have these issues when I was fat. But I also was at my goal weight for 3 years before I started having problems. I am pretty sure that being healthy isn’t what is wrong with me. The Dr. is happy with my weight, eating, and exercise habits. And he’s very pleased that i’ve been able to maintain the healthy weight. Yes, I eat a certain way. A healthier way. But I don’t deprive myself and i’m not restrictive. Nothing is off limits, unless it’s for a medical reason (still Gluten Free for now). I make sure I get the Weight Watchers Good Health Guidelines every day. Most of what I put into my body is good. Now what my body chooses to do with those vitamins and nutrients, I have no idea. Sometimes I wonder if that’s working quite right. Visited with my parents and my aunt about family history. Nothing. I’m currently waiting for another round of blood work results to come back, not even sure what was tested yesterday. Wait and see I guess? I like when someone knows exactly how to make me smile and when I need it most…. Yesterday afternoon. 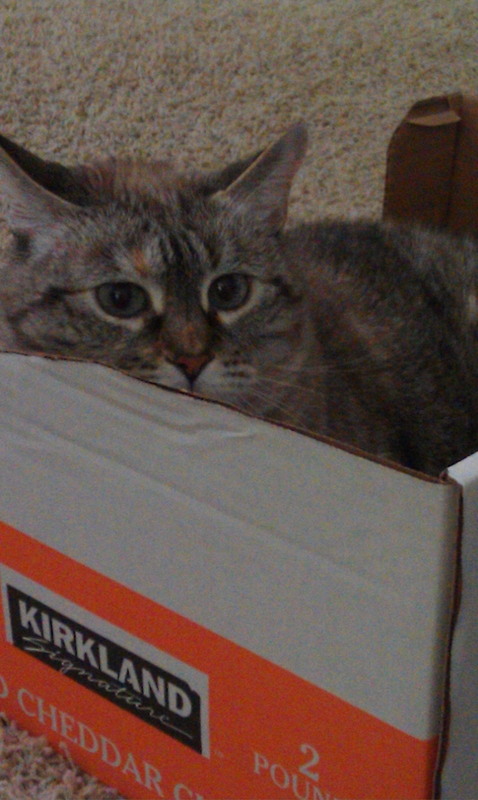 1 fat cat+1 box from Costco=instant laughter. Going to tell the story, it’s embarrassing, but it’s what i’ve been going through. A week ago was the 1 year anniversary of me having health issues. Started off with chronic constipation. My colon wasn’t emptying like it should. Half the time I had trouble even sitting down, standing up I looked pregnant. Went through 1 unreadable ultrasound ordered by my old Dr. last summer, then another ordered by my Gyno. a month later (also couldn’t be read) and 1 catscan of my abdomen ordered by the GI specialist that I saw from October until January (showed nothing). The GI’s conclusion was IBS and that I needed to take Miralax forever (took it for 8 months). In the spring I got tired of it. The Miralax wasn’t helping and I wasn’t feeling better at all. My teeth seemed to thin out, skin issues, brittle nails and hair, plus my hair was falling out. I felt like I was putting good stuff into my body, but my body wasn’t using them correctly. I stopped having periods in March. Went to my Gyno, who was my favorite Dr. and asked him what to do. He referred me to my now current Primary Care Doctor in May. He ordered gluten free diet, plus 2 rounds of bloodwork and several visits to see him. May is also when things really started to go downhill. In addition to all of the other symptoms, none of which disappeared, I started having unrestful sleep, joint pain, muscle fatigue, unexpected 5 pound gain in a short amount of time (scared my Dr). I’d already had trouble with weights in the gym, but then running started becoming an issue too. Fast forward to this month. Every workout feels like the end of a marathon. I’ve had days where my legs were so dead, I couldn’t even stand to wash clothes or mow the grass. My muscles don’t feel like they are recovering from workouts and don’t want to work while running. The end of every long run, I wonder how on earth I made it that far and worry how i’ll do when the mileage increases. Looking at the events I’ve signed up for sends me into an instant panic. Even Zilker relay which is less than a 5K. I didn’t really tell anyone (because I didn’t want to jinx myself), but I had an Endocrinologist appointment today to look at the neck ultrasound I had a couple of weeks ago and my bloodwork. I spent 30 minutes trying to hold back the tears as she told me thyroid wasn’t it. Not really sure if she’d already reviewed the panels, why I needed to pay her to tell me that’s not it. I was really optimistic that we’d figured the right road to go down. Here I am again. Dead end. They sent for more bloodwork, the 3rd time this month. Don’t even remember what they ordered. I had to fight back the tears then too, because I am so frustrated. I kept looking around me at all of the really sick people at the lab and reminding myself it could be worse. I will know sometime next week about the other labs, which I don’t expect to say anything. I will stay gluten free for now. I am adding dairy back into my diet. Trying to stay off the web and reading medical journals or anything else, I seriously doubt I am going to find something a Dr couldn’t. I’m really trying to hold my head up high and pray something gets figured out soon, but it’s really starting to take a toll on me mentally and physically. I just want to rewind and have the old me back.